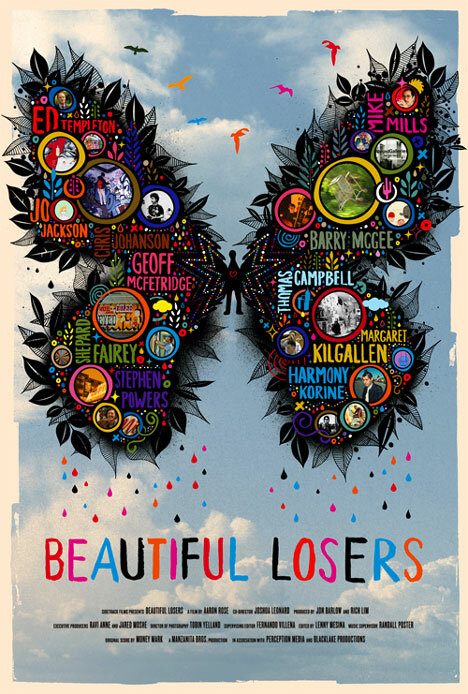 Beautiful Losers celebrates the spirit behind one of the most influential cultural movements of a generation. In the early 1990’s a loose-knit group of like minded outsiders found common ground at a little NYC storefront gallery. Rooted in the DIY (do-it-yourself) subcultures of skateboarding, surf, punk, hip hop & graffiti, they made art that reflected the lifestyles they led. Developing their craft with almost no influence from the “establishment” art world, this group, and the subcultures they sprang from, have now become a movement that has been transforming pop culture. Starring a selection of artists who are considered leaders within this culture, Beautiful Losers focuses on the telling of personal stories…speaking to themes of what happens when the outside becomes “in” as it explores the creative ethos connecting these artists and today’s youth. Beautiful Losers was Directed Aaron Rose and Co-Directed by Joshua Leonard. The film features the artists Thomas Campbell, Cheryl Dunn, Shepard Fairey, Harmony Korine, Geoff McFetridge, Barry McGee, Mike Mills, Steven “Espo” Powers, Aaron Rose, Ed Templeton and Deanna Templeton.